Looking for a New BMW i8 in your area? CarGurus has 371 nationwide BMW i8 dealers with 2,145 new car listings. The BMW i8 Coupe is instantly recognizable by its striking design: the scissor doors, the flowing, two-tone body, and the futuristic interior. It skips the 2018 model year and heads straight into a 2019 version that gets some important new updates. Supplementing the Coupe body style, there is now a new Roadster. It trades the other model’s carbon-fiber roof midsection for a high-quality fabric soft top that folds back in a Z pattern electronically, taking up very little space, and allowing the car’s occupants to enjoy open-air driving. The deployment and stowing of the roof happen in as little as 16 seconds at up to 31 miles per hour. Even with the top folded away, a cowl remains in place, directing airflow over the cabin. The Roadster also nixes the two back seats, accommodating just two people. In their stead are the storage space for the roof and an estimated 3.5 cubic feet of storage space. The i8’s basic powertrain returns for 2019 - a 96 kW electric motor on the front axle coupled with a 1.5-liter inline 3-cylinder engine and 6-speed automatic engine on the rear axle for all-wheel-drive capability. And there are improvements all around. The lithium-ion battery pack increases from 7.1 to 11.6-kilowatt hours. Total system horsepower increases by 12 to 369. BMW estimates that both the Roadster and the Coupe can drive in electric-only mode for 18 miles, up from 15 on the previous model, and sprint to 60 in about 4.2 seconds to a top speed of 155 mph. Fuel economy was not yet available at the time of this writing, but the 2017 and earlier i8 achieved 74 MPGe in hybrid mode and 29 MPG in gas-only mode. 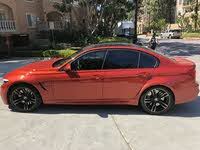 BMW has also focused on the design options, adding E-Copper and Donington Grey metallic shades to the color palette, both of which come with Frozen Grey metallic cladding. Inside, the Giga interior theme is standard for both Coupe and Roadster variants, in Ivory White for the Coupe and Ivory White/Black for the Roadster with optional dark Amido. Otherwise, there is an all-new Tera World Copper theme with E-Copper Upholstery and optional carbon fiber interior trim. Redesigned 20-inch wheels come standard on both body-styles, now lighter than the lightest wheel options for the earlier models. The i8 continues to come with a long list of standard high-tech equipment. There’s a fully-digital instrument cluster, a head-up display, a 360-watt Harmon Kardon system, and the latest iDrive 6.0 infotainment system with navigation. The i8 also has BMW Connected, which includes route planning that takes into account necessary refueling or recharging stops. As far safety driver assistance systems, the i8 has plenty. Adaptive cruise control and the Driving Assistant Package are standard; the latter bundles a surround-view camera system, frontal collision, pedestrian detection, front and rear parking sensors, automatic high beams, speed limit recognition, and cross-traffic alert. 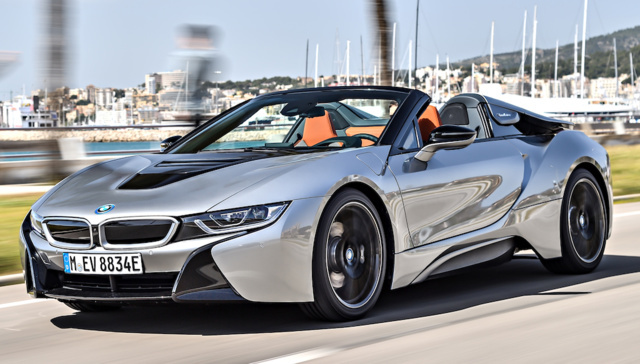 The 2019 improves the i8’s mission of high-tech, efficient travel with key performance, technology, and weight-saving gains, plus a new two-seat, open-top version. Pricing hasn’t yet been announced, but the 2017 started at $147,500 and was eligible for a tax credit from the federal government. What's your take on the 2019 BMW i8? Have you driven a 2019 BMW i8? Enter your zip to see incentives for a new i8 in your area.